(Baltimore, MD) — (March 9, 2018) — Every summer, the city of San Diego becomes a destination for comics and pop culture fans as they flock to Comic-Con. The event attracts attendees from all over the world and tickets have become quite difficult to acquire. Then there’s the pricey cost of accommodations and airfare on top of the tickets… Well, Diamond Comic Distributors is looking to solve all those problems for two lucky pop culture fans! Diamond is providing the opportunity of a lifetime with The San Diego Comic-Con Total Prize Pack! 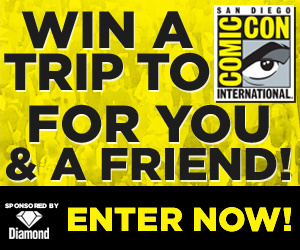 Diamond will give one grand prize winner and a friend roundtrip airfare, a five-night hotel stay, and four-day passes to Comic-Con in San Diego, the biggest comics and pop culture convention in the world! Diamond will give the winner and their guest four-day passes, which includes admission to Preview Night on Wednesday so you can get a jump on shopping for comics, collectibles, and other goodies! You’ll stay at the four-star, waterfront Manchester Grand Hyatt in downtown San Diego, which is located right next to the San Diego Convention Center. And the winner will receive a Comic-Con exclusive item courtesy of Diamond Select Toys! So how do you enter this amazing contest? We’re glad you asked! Head over to Diamond’s Gleam Campaign, and fill out the required entry information. From there, you can increase the number of times your name is entered in the drawing by engaging with Diamond’s social media and e-newsletters. In other words, following Diamond’s many pop-culture Twitter, Facebook, and YouTube platforms, as well as subscribing to e-newsletters will enter your name into the drawing pool between five to ten more times per interaction. Get your name in there as many times as you can and you could be going on the pop-culture trip of a lifetime! Learn more about the contest and enter by APRIL 30 to win here!